Water is the basic building block of our humanity--without it, human, animal, and plant life could not survive. Without it, our global goals of ensuring sustainable development, peace, and security are unachievable. Water washes over more than 70 percent of the surface of our blue planet, yet as of this Earth Day some 1.5 to 2 billion people have no reliable source of clean drinking water. Another 2.5 billion do not have access to basic sanitation facilities. How can one-third of the planet's population drink, bathe themselves and their children, fight disease, produce food, and live with dignity when they don't have safe water or adequate sanitation? The United States is working to create a more water secure world by increasing access to safe drinking water and sanitation, improving water resources management, and promoting cooperation over shared waters. These are just some ways that State Department and U.S. Agency for International Development (USAID) foreign assistance dollars support our environment and our shared Earth. To do this, the State Department and USAID invest in capacity building, infrastructure, technology, private sector partnerships, and innovative financial instruments that mobilize local capital. Between 2007 and 2016, the United States has allocated in excess of $6.0 billion in water and sanitation activities in more than 50 countries worldwide. This support will help us empower our partner countries to meet the needs of their citizens, improving access to safe drinking water, sanitation and hygiene; enhancing water resources management; and mitigating tensions associated with shared waters. These activities have made real and lasting impact for people across the globe. As a result of these activities, more than 50 million people have received access to improved drinking water and/or sanitation services. We have also developed several innovative partnerships that have helped mobilize support from across the United States. The US Water Partnership (USWP) is a prime example of this. In 2012, the State Department helped launch this new public-private partnership in order to unite and mobilize American knowledge, expertise, and resources to address water challenges around the world, especially in developing countries where needs are greatest. To date in 2016, the USWP has aggregated commitments worth over $1.3 billion dollars from 112 members, and has impacted the lives of people in over 100 countries. In 2013, USAID launched its first ever Water and Development Strategy, setting new WASH and agricultural water management targets to be met by 2018. Since then, more than 7.6 million people gained access to improved drinking water and nearly 4.3 million people gained access to improved sanitation facilities. 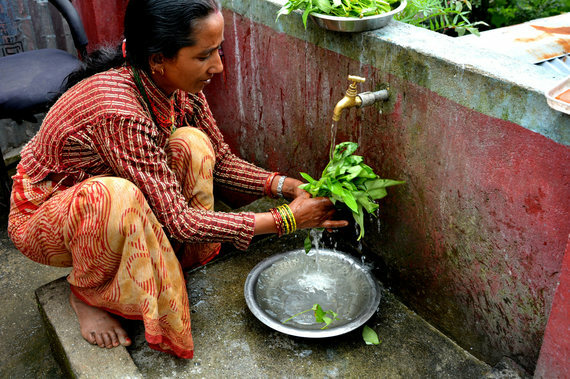 At this current rate, USAID will reach its goal of improving water access for 10 million people and improved sanitation access for 6 million by 2018. We must build on these successes to be able to continue to meet human, livelihood, and ecosystem needs. The Sustainable Development Goals (SDGs) will help us remain focused on achieving water security for all. In 2015, The United States and 192 other nations formally adopted the 2030 Agenda for Sustainable Development at the UN Summit on Sustainable Development in New York. Goal Six of the 2030 Agenda, "Clean Water and Sanitation," lays out a number of targets including universal and equitable access to safe and affordable drinking water for all by 2030. To achieve this and other SDGs, we will need strong support for foreign assistance resources in FY 2017 and beyond. We will also need to work with the private sector, civil society, academic institutions, donor countries, and developing countries themselves to mobilize resources and form collaborative partnerships with a diverse array of stakeholders. In line with the SDGs, and as a part of this year's Earth Day celebrations, the State Department will host the annual 6k Walk for Water on April 28, 2016. This walk acknowledges the millions of people in the developing world, most often women and girls, who walk an average of six kilometers a day to collect water for their families. The task of collecting water keeps children out of school and prevents women from engaging in more productive economic activities and often puts both women and children at risk of physical assault. The United States drives solutions to the global challenges we face today, our foreign assistance the fuel and our foreign policy the lanes in the road guiding our way. From fiscal commitments that support the SDGs to awareness raising activities like the Walk for Water, the United States is proud to join the international community in addressing the global fresh water crisis. Recognizing that water permeates everything, we commemorate Earth Day by reminding ourselves that an investment in our global community is not only the right thing to do, but it is ultimately an investment in our collective future on this blue planet.